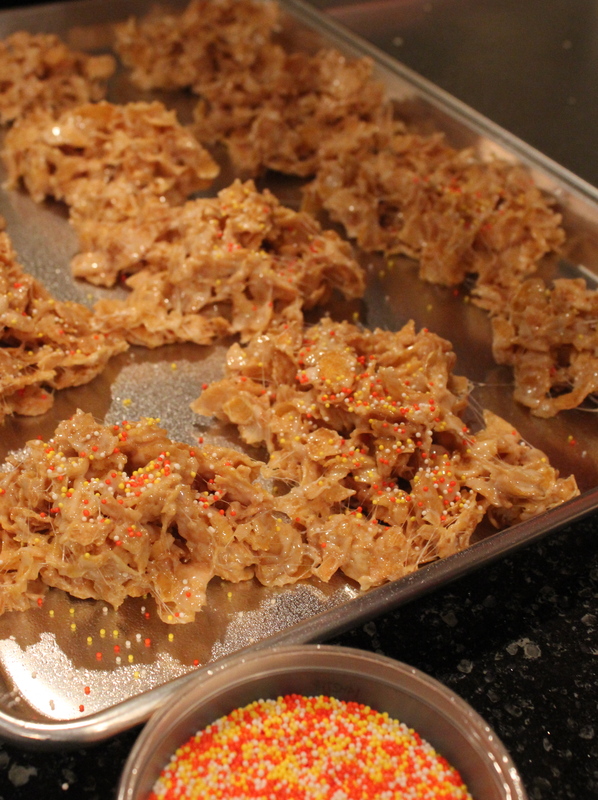 My husband originally dubbed them ‘leaf piles.’ We had been dating for over a year and after celebrating the holidays together he still craved the corn flake wreaths with the cinnamon candies on top. Instead of going to the trouble to dye the melted marshmallows green, he left it white and instead of forming cute little wreath shapes he just plopped the marshmallow and corn flake mixture down on a cookie sheet. 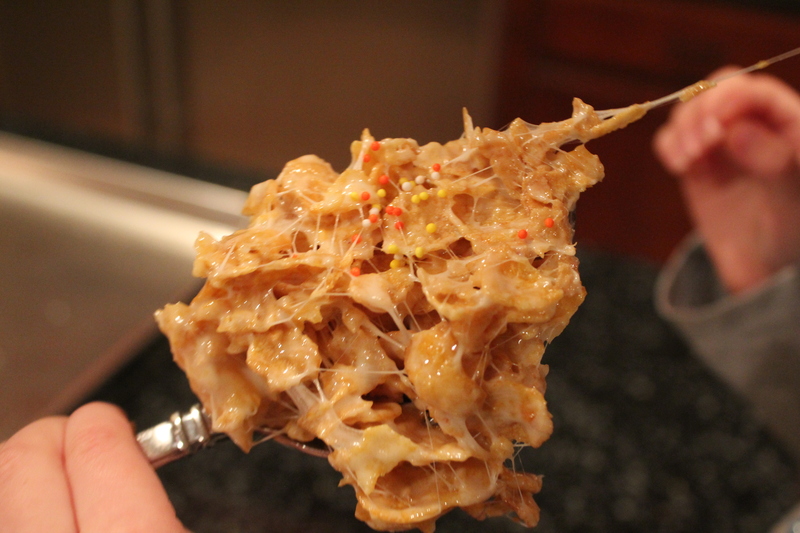 It was just like a Rice Krispie Bar, but with corn flakes. So good! Fast forward eleven years later and now our children are addicted to these gooey, yummy treats. If you are looking for something easy and somewhat healthy to make for Thanksgiving at the kids table then try this recipe. My kids don’t care for pumpkin or pecan pie so this is what they will be munching on this year. They don’t even want Rice Krispies anymore, they are strictly Corn Flake treats addicts(aka Leaf Piles). You could also add red, orange or yellow food coloring to the mix to make your leaf piles look more vibrant. 1. In a large pot, slowly melt the butter with the stove set on medium-low heat. Be careful not to burn the butter. Keep stirring until it is completely melted. 2. Add marshmallows and continue to stir until all the marshmallows are melted. 3. 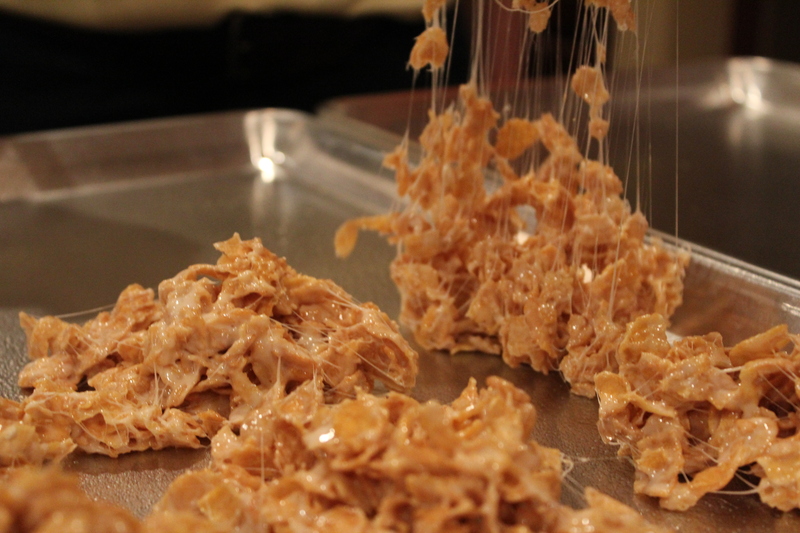 Pour Corn Flakes into melted marshmallows and stir until combined. 4. On a baking sheet lined with parchment paper or sprayed with non-stick spray, drop cereal mixture by heaping spoonfuls. You should end up with 12 leaf stacks. 5. Sprinkle with colored sprinkles such as orange, red or yellow. Enjoy immediately or store in an airtight container for up to 3 days. Special K works great too! I usally add vanilla extract to my marshmellow mix (or almond extract). Oooh! I love those ideas. Thanks AK! Looks good! Nice and easy is the key!